Imitating the sentiments of the masses is not necessarily a wise call. There are certain situations where one should not simply sell shares even if everyone else is doing so. The stock market is a fickle mistress! Often investors are left wondering what happened. They believe that they were making a safe and sound decision but it turns out to be the golden opportunity that they let slip through their hands. Imitating the sentiments of the masses is not necessarily a wise call. There are certain situations where one should not simply sell their shares even if everyone else is doing so. You may have purchased the shares of a company thinking that the price will rise, but contrary to your belief, the price starts sliding down. At such moments, one must not panic and sell the shares assuming that losses will be minimized. One should analyze the reason for the drop in prices and predict the lowest point to which the share price may fall. At the lowest point, one may buy more shares so that the purchase cost of all the shares averaged out. Human beings have an enormous host of emotions, many of which can be triggered due to innumerable reasons. 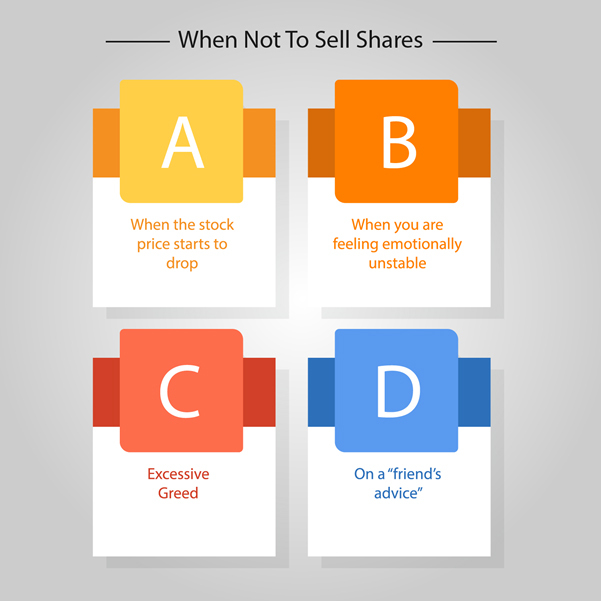 One should not sell shares when they are under emotional duress. When a person sells shares based on sentiments and not because of the market conditions, they are bound to slip and make a mistake. If one experiences an emotional upheaval, they should wait until they've calmed down and then consider their next move. Many don't quit while they are ahead. The share market is a zero-sum game. One must realize the point where he or she is ahead of the game and sell the shares. There comes a point when the stock price reaches the peak of your expectations. Being greedy in such instances and hoping that the share prices will rise even higher is not at all advisable. Beyond the point of your expectations, one must not stick around. If the market collapses, you would be left feeling quite foolish, considering you had decided to hold on when your gut was screaming "sell". When a person gives you tips to sell the shares at a particular price, be sure to do your own research. If there seems to be no time to do a background study, it is advisable to let the so-called opportunity slip by.